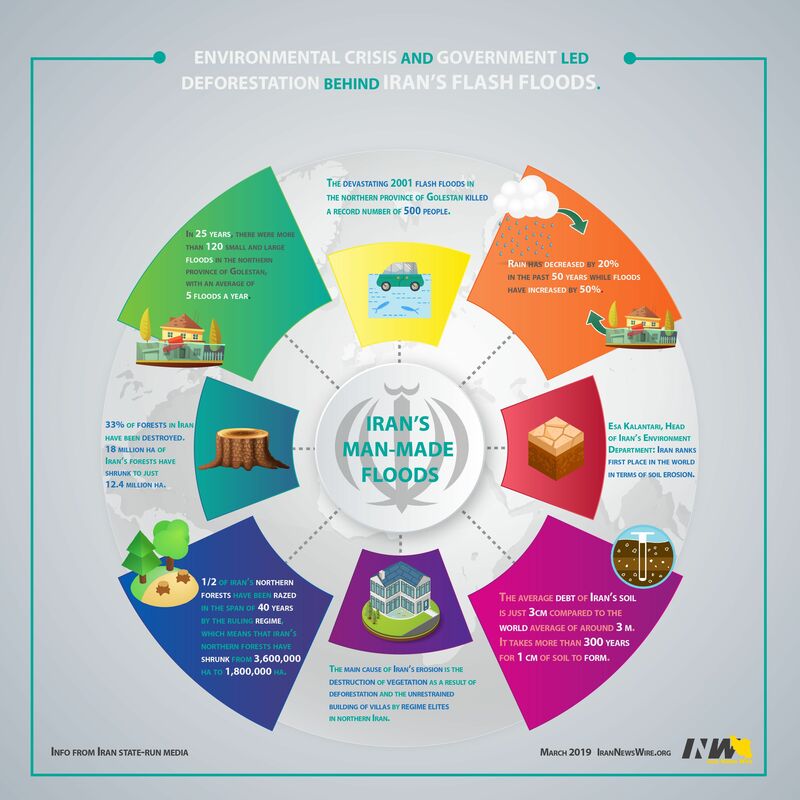 The main reason behind Iran’s devastating, lethal flash floods is 40 years of environmental mismanagement and government led deforestation. According to the state-run Hamshahri dail, in the course of 25 years, there were more than 120 small and large Iran floods in the northern province of Golestan, with an average of around 5 floods a year. Rain has decreased by 20% in the past 50 years while Iran’s floods have increased by 50%. The devastating 2001 flash flood in the northern province of Golestan killed around a record number of 500 people. 33% of forests in Iran have been destroyed. That means that the 18 million of hectares of Iran’s forests have shrunk to just 12.4 million. 1/2 of Iran’s northern forests have been razed in the span of 40 years by the ruling regime, which means that Iran’s northern forests have shrunk from 3,600,000 hectares to 1,800,000 hectares. Every year, around 600 hectares of northern forests are destroyed. 200,000 hectares of northern forests were destroyed in forest fires in the past 40 years. Esa Kalantari, the Head of Iran’s Department of Environment: Iran ranks first place in the world in terms of erosion. The average debt of Iran’s soil is just 3cm compared to the world average of around 3 m. It takes more than 300 years for 1 cm of soil to form. The main cause of Iran’s erosion is the destruction of vegetation as a result of deforestation and the unrestrained building of villas by regime elites in northern Iran. Please click here for better resolution.